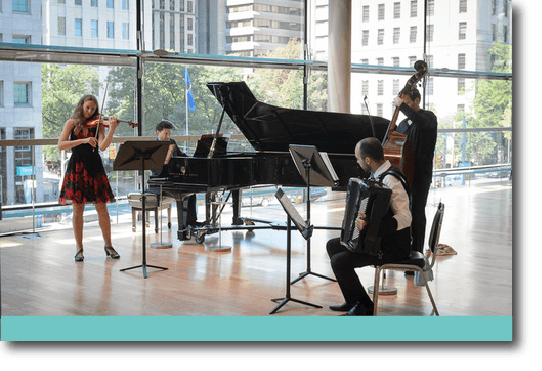 Founded in 2013, Payadora Tango Ensemble performs an expansive repertoire that draws from the height of Buenos Aires’ Tango tradition, including compositions and arrangements by De Caro, Pugliese, Troilo, and Salgan, to the masterful, contemporary sounds of Astor Piazzolla and beyond. Drawing from each member’s eclectic backgrounds in Classical, Jazz, Latin, Eastern European folk music, and improvisation, Payadora’s performances exude technical virtuosity, playful spontaneity, and rhythmic vitality. Highlights from Payadora’s past performances include sold-out shows at the St. Lawrence Centre for the Arts, Harbourfront Centre, Toronto Music Festival at Heliconion Hall, the Lula Lounge, the Jazz Bistro, the Rex Hotel Jazz and Blues Bar, the TD Toronto Jazz Festival, The Toronto Botanical Gardens Concert Series, the Kingston Road Village Concert Series, the Knox United Church concert Series, the Group of 27 Concert Series at Heliconion Hall, and for the Canadian Opera Company’s World Music Series at the Four Seasons Centre. In one of their many collaborative appearances, they performed a symphony show with the London Symphonia in March of 2017. Following a September showcase in Cape Breton at the 2017 Contact East event, they will appear with the Hannaford Street Silver Band in October, 2017 at Toronto’s St. Lawrence Centre for the Arts.